As the image is born from the catalog value is not momentum, but the ball retention is good, is over to easy racket very rotation. Blade size is slightly larger, the weight is located in its own way. When you put a heavy rubber is what you want to note the weight. Speed ​​is not so much fast, but if Shimae even shaken off, the amount of rotation is often the drive is to enter firmly. Bench also is over to easy the very rotation. Personally, the only of the block is pushed tend to hit, I felt that there is no momentum to the ball. Good ball was put out and it felt to return multiplied by the rotation in the vicinity of the platform. In addition, Chiquita is is easy to spear was not the fault of the mind (laughs) momentum also rotate, the user's own power, because depends on the ball touch, true growth is likely to visible racket, and. Since the heavy drive strike, it can also be used by advanced users. First of all, this racket is very easy to rotate. So if you put a rubber that spins, you can get a ball that spins very much. Also, you can stretch without worrying about the weight of the rubber as it is not too heavy. Nakayama （Experience：２〜３ years）	Recommended for beginners. I scraped Korbel's FL and used it in ST. Colber is better for ST, I will definetly. The weight was heavy, 92 grams. The amount of rotation is perfect for top class even with wood. Although I can publish it if I think to put out speed, it is not a lot of people who go out too much. The momentum is also fair. Just feeling shot feeling is very good. It is a shot feel like wrapping a ball. It is also great for beginners, but it's enough if you do not ask for momentum. I bought this racket now, but I was surprised with the balance being insanely balanced. It was a racket which is considerably easy to use in total though it seems to be uncomfortable for the hand grip slightly feeling like flat. I think speed is reasonable, but I think I can put out a heavy ball. Moreover, it can be used even from beginners because spin and control are also good. Although the feeling of the blade is large, this size is a good feeling with a size that can be played in almighty. Although the weight is heavy in this spec band, I think that it is just fine if the weight is higher and it is possible to put a heavy ball or the block is stabilized. Rubber is sticky, tension, back, table, grain, whatever. 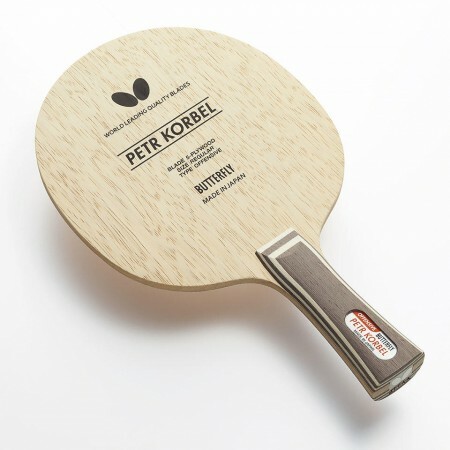 I started table tennis from high school student and bought it for the first one. From the conclusion it is very easy to handle, and I used high school for three years since I was able to make good spheres even after the technology improved so much. Because it is soft wood, it rotates well and it is easy to rotate. I recommend it to beginners, but I felt that I could use it satisfactorily for a long time if I made the rubber harder and raise the power every time the technology came up. However, I seemed to have selected heavy individuals, and if I made the back rubber too hard it exceeded 200 g on both sides thickness (about 2.0). According to rumors it seems that there are many heavy individuals, so when buying Corbel you should measure the weight at the store and choose the lightest possible. Since the racket itself is heavy, it may be hard at first. However, there is plenty of playing and it is easy to do any technology. Rubber fits anything. If you are an ordinary person from beginner (not beginner) to intermediate advanced, performance is perfectly acceptable.